Canister vacuum cleaner for hame uise. A vacuum cleaner (in the UK kent colloquially as a hoover an aw.) is a tuil that uises an air pump for tae mak a pairtial vacuum for tae souk up stour an clart, for ordinar frae fluirs. Maist hames wi cairpetit fluirs in developed kintras haes a vacuum cleaner for the cleanin. The clart is gaithered by a filterin seestem or a cyclone for tae be gotten redd o later. Some Scots leid enthusiasts hae cleckit the calque stour-souker frae the German Staubsauger for vacuum cleaners. ↑ In Breetain Hoover haes become sae associate wi vacuum cleaners for tae become a genericised tredmerk. 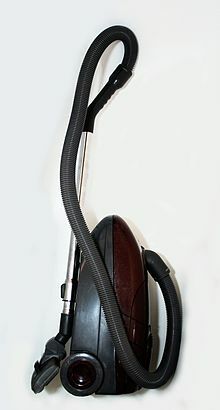 The wird "hoover" (athoot ineetial capitalisation) is aften uised as a generic term for tae mean "vacuum cleaner". Hoover is uised as a verb an aw, as in "A juist hoovered the cairpet". This page wis last eeditit on 12 Februar 2019, at 20:42.